During the Colonial period, the future Hollywood was part of the San Fernando Mission–its outlying pastures, on which sheep grazed. In 1887, Harvey and Daeida Wilcox founded their Christian utopia as an agrarian village–one that had more orchards than houses. 19th- century Hollywood produced excellent lemons, poor oranges (used for orange soda, not fresh juice), flowers immortalized by the painter Paul deLongpre, and some rather exotic fruits and vegetables. 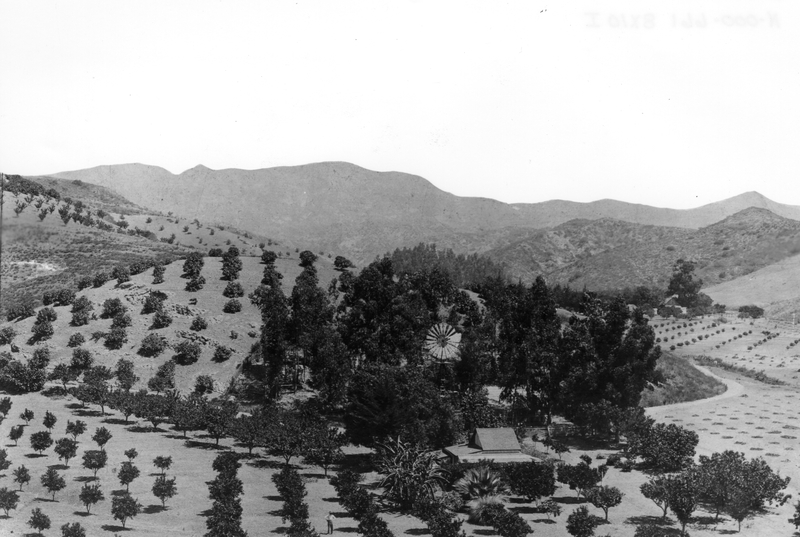 Among the crops that were grown in Hollywood’s orchards were bananas, figs, apricots, avocados, dates, pineapples and chermoyas. The Krotona Colony included fields and gardens– presumably worked by its members, though I’ve seen no photographs proving it. The mystery in all of this is how these farmers managed to coax crops out of Beachwood’s soil. Thin and nutrient-poor, it sits atop solid granite, the result of which is geological stability–we barely feel earthquakes–and the constant appearance of rocks and stones. Since moving to Beachwood 5 years ago, I’ve struggled to make something of my garden, despite assiduous efforts at soil enrichment. Although roses do well with regular applications of compost and fertilizer, vegetables grow with limited success, and only in boxes. Interestingly, the ten fruit trees I’ve planted have stayed true to historical precedent, producing terrible oranges (if any), but wonderful lemons, peaches and apricots. This year, I planted a green gage plum whose first crop I’m eagerly anticipating; more on it, and the “Pineapple Tract,” in a future post. The Story of Hollywood, by Gregory Paul Williams. 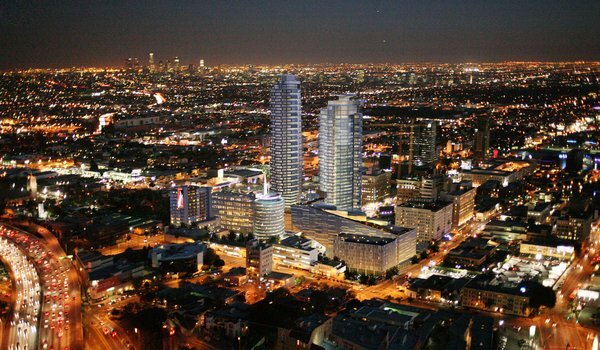 Los Angeles, CA: BL Press, LLC, 2005. The turn of the 20th century was also a turning point for Hollywood. No longer a farming community of like-minded Christians but not yet the seat of the movie industry, the village of Hollywood briefly became a garden suburb for the newly wealthy. Among this second wave of Hollywood settlers was E. C. Hurd, whose sprawling Victorian home is pictured above. Hurd dug his fortune from the mines of Colorado and invested it in a prime Hollywood tract, on which he built a mansion and planted a lemon grove. 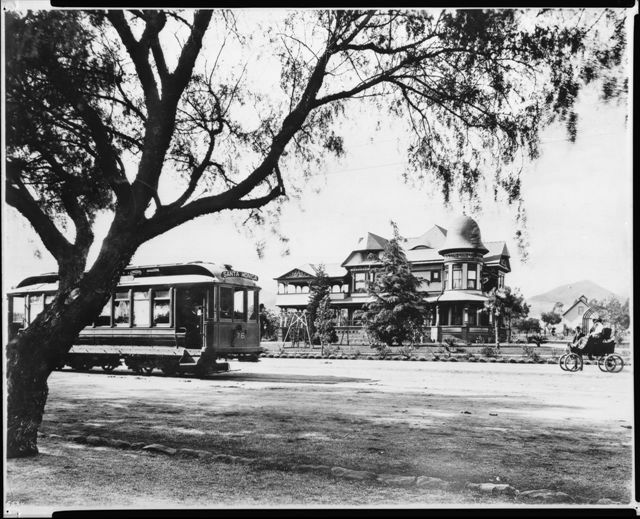 Here we see his estate on the north side of Hollywood Blvd., with an early motor car–presumably his–to the right. Only the pepper tree in the foreground hints at agriculture; far more portentous is the Santa Monica-bound streetcar on the left. Part of the Pacific Electric Railway Company’s growing inter-urban network–soon to be the world’s largest public transportation system–the trolley car took passengers from downtown Los Angeles to the beach, though Hollywood probably was the more popular destination. Beyond the obvious, the photograph foreshadows Hurd’s own future in business. He would soon purchase the Cahuenga Valley Railroad and extend the line to Laurel Canyon, opening it to residential development. Perhaps the most famous Hollywood transplant of the time was Paul de Longpre, a French horticultural painter who arrived in Los Angeles with his family in 1889. After de Longpre discovered his ideal flowers growing in Hollywood, he met Daeida Wilcox, who was so anxious to attract culture that she gave him her homesite, three lots on Cahuenga just north of Prospect (later Hollywood Blvd. ), for his estate. 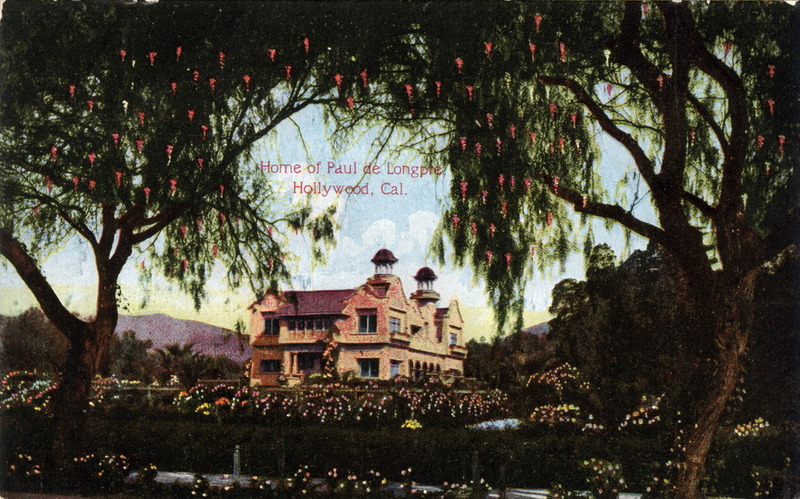 The mansion and gardens Paul de Longpre built not only drew Hollywood society but served as a lure for new property buyers and tourists. So many visitors came to see “Le Roi des Fleurs” that the P.E. Railway added a trolley spur on Ivar Avenue to deposit them closer to the estate. Tours of the house and gardens, along with prints of his floral paintings, supported the de Longpre family until the artist’s death in 1911. After his family returned to France, the house and gardens were demolished for their valuable real estate, and de Longpre’s paintings–romantic still-lifes of roses, orchids and the like–fell permanently out of fashion. If not for De Longpre Avenue, most Hollywooders today would not recognize his name, let alone his art. Coincidentally, 1911 was the year Los Angeles’s public transport system became the world’s largest, with 1,000 miles of track. In Hollywood, the year not only marked the end of de Longpre’s era but the beginning of another, as a new wave of residents discovered the town: movie people. More on them in future posts. As anyone who has visited can attest, Hollywood is full of Protestant and Catholic churches; it boasts three major synagogues and temples of various Buddhist and Hindu sects as well. In addition, Hollywood has long been a hub for nontraditional religions, from the Theosophical Society in the early 20th century to the Church of Scientology today. But all these houses of worship merely hint at the town’s religious history: from its beginnings in the 1880’s to its absorption into Los Angeles in 1910, churches were Hollywood’s raison d’etre. Hollywood’s powerful religiosity sprang directly from its founder, Harvey Wilcox, a devout Protestant and vehement teetotaler. In order to draw like-minded residents to Hollywood, he granted free land for church-building. 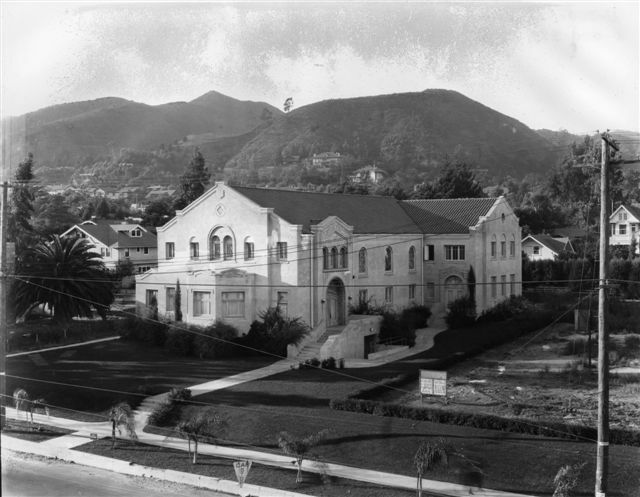 Although Wilcox didn’t live to see the ultimate result, large houses of worship dominated Hollywood Boulevard by the beginning of the 20th century. Hollywood’s original churches have all been rebuilt since, though many of the names–Hollywood Presbyterian, St. Stephen’s Episcopal, Church of the Blessed Sacrament and Hollywood Methodist Church–remain the same. Interestingly, St. Stephen’s traces its lineage directly to Daeida Wilcox, mother of Hollywood. Tired of commuting to Colegrove (now West Hollywood) to worship at St. James’ Mission, she donated land at Prospect (now Hollywood Blvd.) and Ivar for a new church. 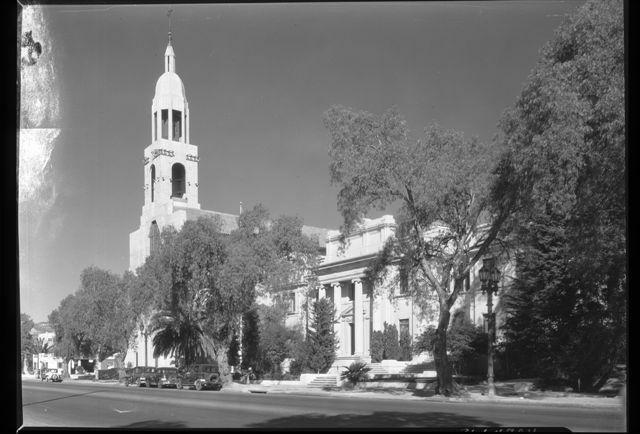 At that point, most of the congregation and even its rector relocated to Hollywood, sharing quarters with the Catholics at Blessed Sacrament until St. Stephen’s was completed in 1903. You are currently browsing entries tagged with Daeida Wilcox at Under the Hollywood Sign.